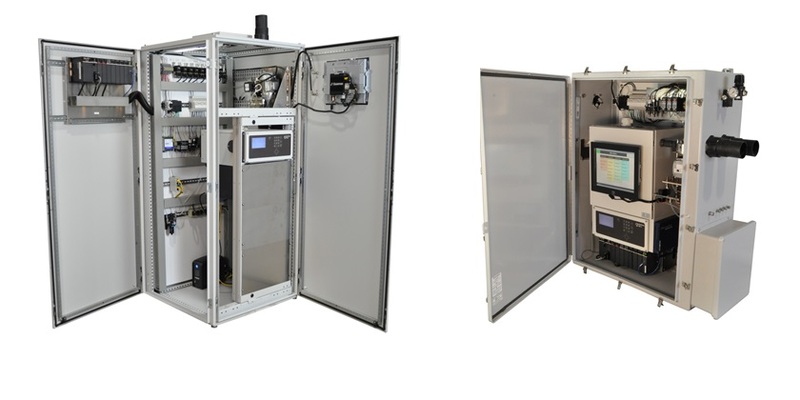 For the past several years, the personnel at EcoChem Analytics have provided Hot-Wet Multicomponent IR based Continuous Emissions Monitoring Systems (CEMS) for regulatory and process applications. These systems have been installed at locations ranging from power plants, cement kilns, waste incinerators etc. throughout the world. In spite of their tremendous performance track record, frequently the question that is asked to us is … “Why is your Multicomponent system superior to the traditional discrete analyzers system which is proposed by other vendors?” ... we will answer that question! We start by examining the two crucial components in a CEMS --- the sampling system and the analyzer detection technique. Summarizing our technology --- EcoChem Analytics uses a Hot-Wet approach where the entire system (probe, sample line, pump and sample cell) is maintained at a temperature greater than 185 degC (365degF) and all components are detected using ONE analyzer. The primary key for a successful sampling system is to keep the system as simple as possible while addressing four primary concerns related to particulate build up, corrosion, condensates and reactive gases. This is accomplished in the EcoChem Analytics sampling systems using specially designed and now refined components. 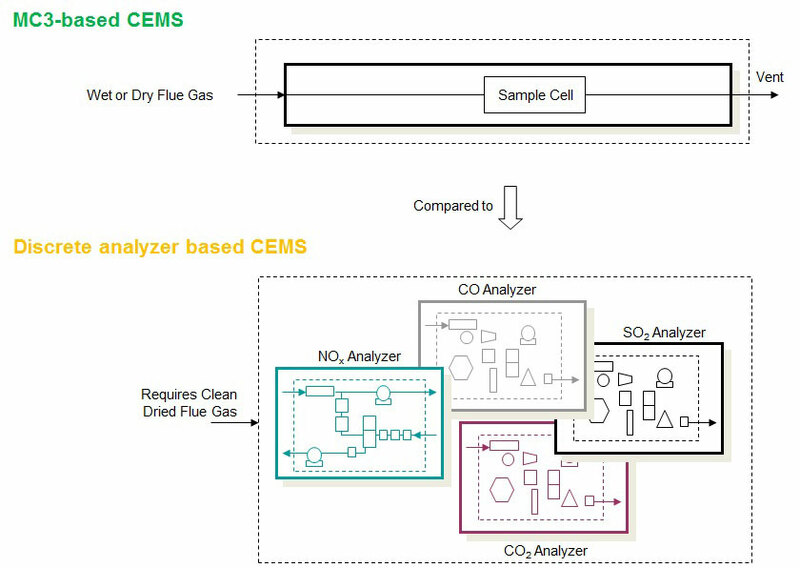 The basic system that the EcoChem Analytics CEMS uses is the “HW” (Hot and Wet) method. The HW sampling system maintains high temperature throughout the sampling and analysis process. This approach provides the unique capability to directly measure HCl and Ammonia. In the HW system only four parts are in contact with the flue gas. Heated Probe details available here. The fact is that all gas analyzers suffer interference from other common stack gas constituents. This is as true for Chemiluminescence NOx and Pulsed Fluorescence SO2 analyzers as it is for Infrared devices. In most cases the effect is manageable but still, however no discrete analyzer is capable of performing direct corrections for interferences. Given that a multicomponent analyzer can easily measure those interfering compounds, it is just as easy to continuously correct the measured variable in real time. Direct Measurement of All Gases. Incredibly, many analytical techniques are incapable of directly measuring the gases they are intended for—they must use converters or indirect methods, which always inject inaccuracies into the measurement. This is especially true for the chemiluminescence reaction, which is commonly used by NOx analyzers. In that reaction only the NO fraction results in chemilumenescence, the NO2 fraction is ignored. Thus to claim the ability to measure NOx, chemiluminescence analyzers must include a catalytic converter which adds cost, complexity and are of dubious efficiency. In many combustion sources the NO2 component is very small and even with malfunctioning NO2 converters can fall within the wide accuracy requirements of the regulatory authorities. However, with sources rich in NO2 such as gas turbines an inefficient converter can cause serious accuracy problems. By having one analyzer make all measurements, the parts count alone is drastically reduced. That is bound to reduce the number and brands of source lamps that can expire, capillaries that can plug, sample cells that can become contaminated, and control systems that may crash. One analyzer also means that plant technicians do not have to be trained and proficient in multiple analytical techniques, nor do they have to stock parts for a room full of different instruments. • Sample cell volume reduction resulting in a more compact analyzer. This also translates to reduced calibration gas usage. • Preventive maintenance cycles are extended to every 6 months, rather than weekly or monthly. For two measured components the cost for the MC3 multi component analyzers is roughly equivalent to the use of discrete analyzers if one considers the additional system integration cost of experienced with multiple analyzers, and the need for independent system controllers. An even stronger economic case can be made when there are three or more measured variables (for detailed cost analysis contact EcoChem Analytics. Multicomponent analyzer details available here.